Merhaba, now you know how to say hello in Turkish. 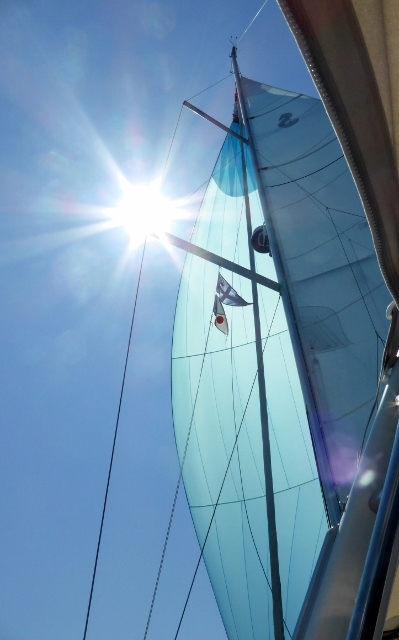 We have been made most welcome in Turkey in one of the finest marinas we have seen on our journey. It is tight quarters, so they assist you in and out, with men on the dock and nudges from the man in the rib (Zodiac). The showers would have Geoff and Deb purring, with big rain shower heads and beautiful fixtures but also with air conditioning. Hair dryers in air conditioned comfort. 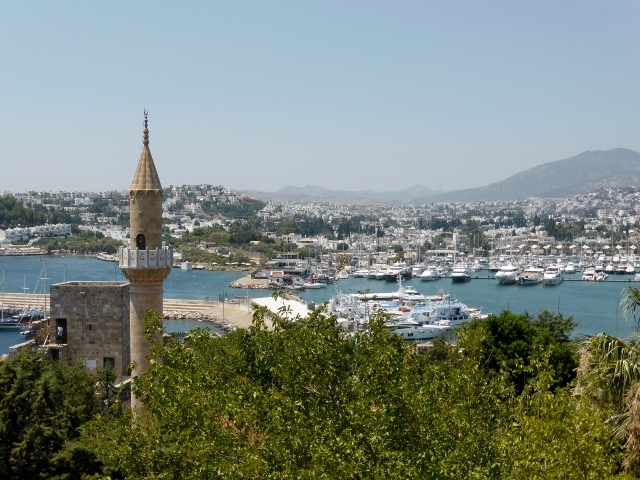 Being sent to the showers in Bodrum Marina, is more like a reward than reprimanded. It is heaven, mainly because it is so hot. 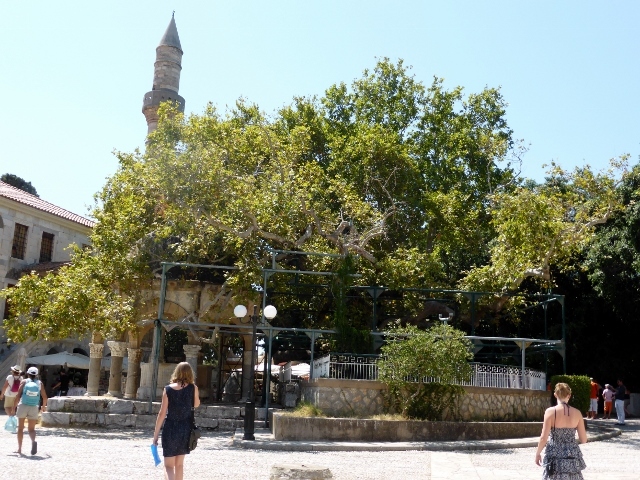 Turkey isn’t so different from Greece, until the evening call to prayers, which reminds you that you are indeed aren’t in a resort but in a different country with different norms. I have a few dresses and they will be getting more wear because I will need them to visit mosques and actually they are cooler. Our first afternoon was busy with clearing customs, James went to the marinas’ Customs agent and they looked after everything, including delivering us to Customs hall across the bay via the same rib. 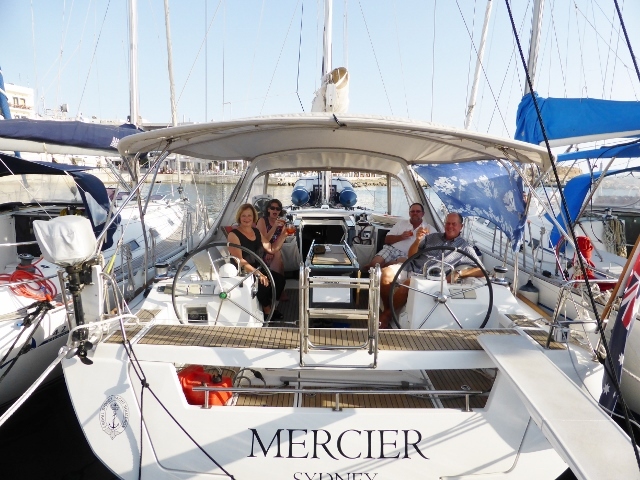 We also met the owners of a Sydney 48′ Oceanis called Gumnuts, Shiree and Martin hail from Leura and have the big sister to Mercier, it seemed twice as wide as ours. Nice to say hello and hear about their plans for travel in Turkey, discuss blue cards and transit logs. 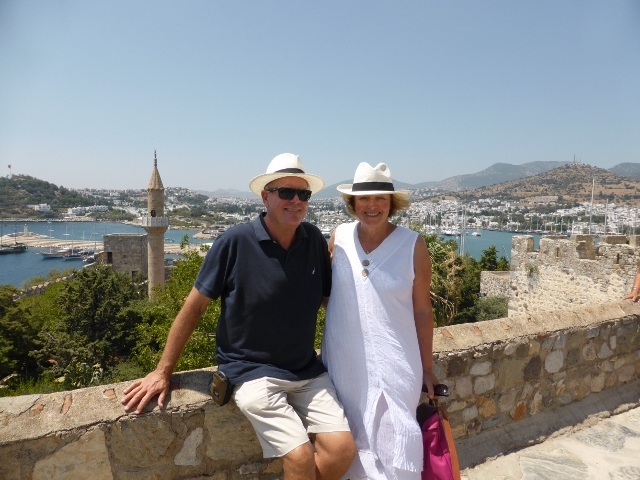 The next morning we went across the bay to the castle and high on the ramparts you can see how beautiful Bodrum is with white houses reaching down the slopes of the hill and amphitheaters on the hillside. 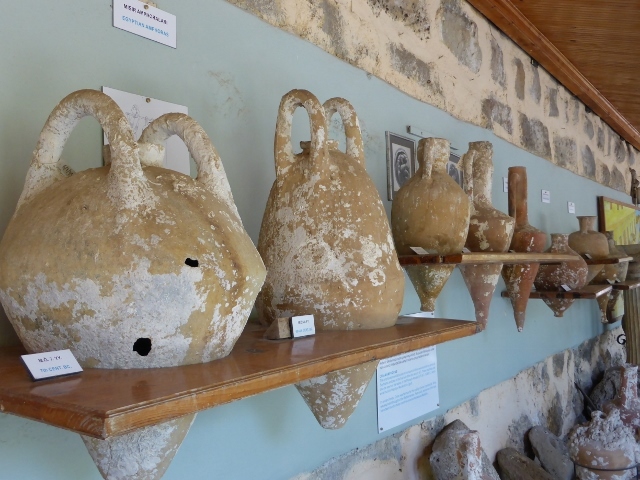 Amphora taken from shipwrecks for oil. wine and other storage. 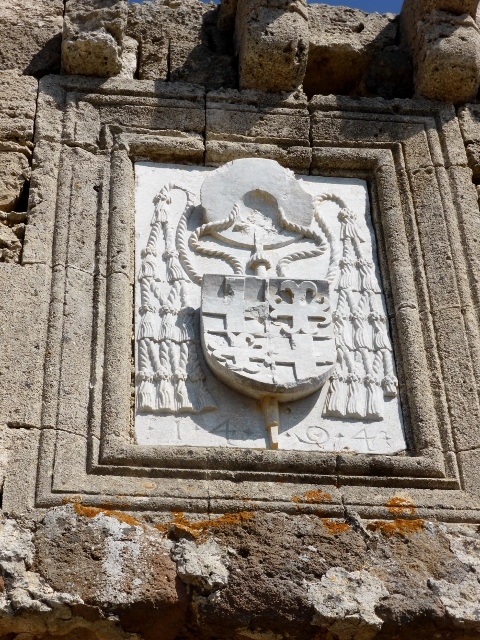 The Castle of St John is another Crusader fortress and it is so interesting to see the dated heralds on the wall. 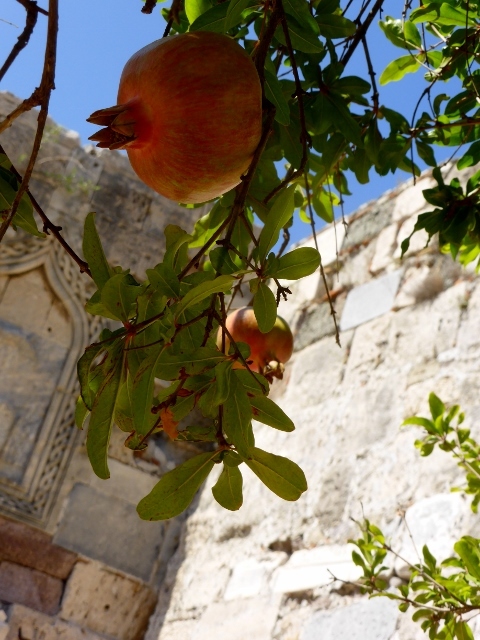 There is a garden inside the wall and a chapel turned mosque that is now a museum. 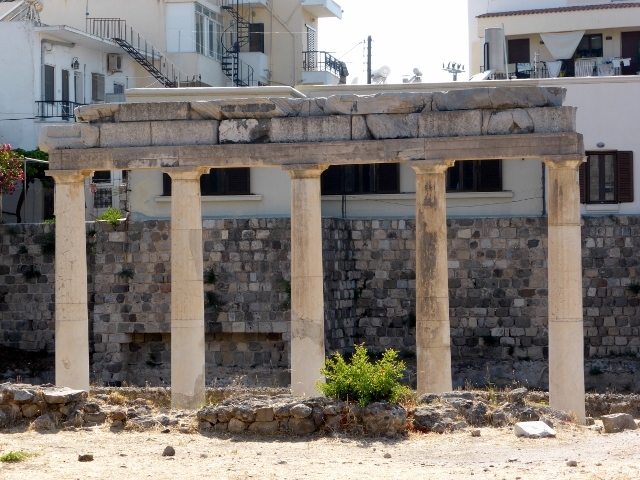 Another tower houses the Underwater Archaeological Museum which is fascinating. 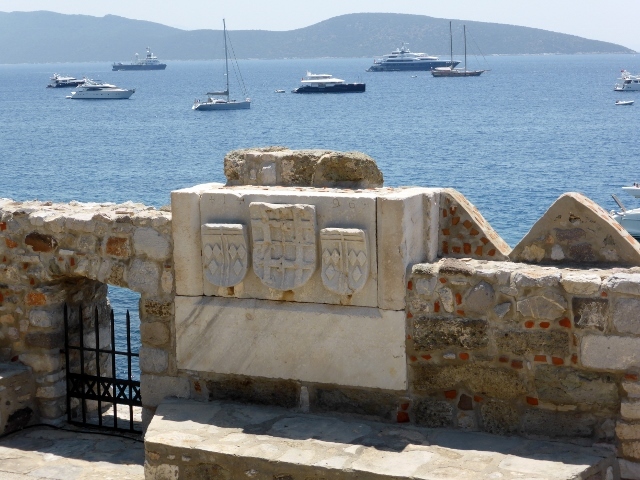 Bodrum Bay from the bastion. Lamb is the national dish, so James is happy and we are looking forward to visiting fruit and vegetable markets.I confess that I was thrilled to see a Starbucks, mainly for the icy Frappuccinos, as I haven’t found gelato here yet. I spent a few years here in Izmir, Turkey as a kid and a bit of my Turkish came back , I could remember the numbers but didn’t recognise one name of the days. No one has snickered but I do wonder if I can trust my memory. We are so excited to begin the Turkish adventure and also thinking about the friends that will be visiting soon. Rene and Richard your room is ready. 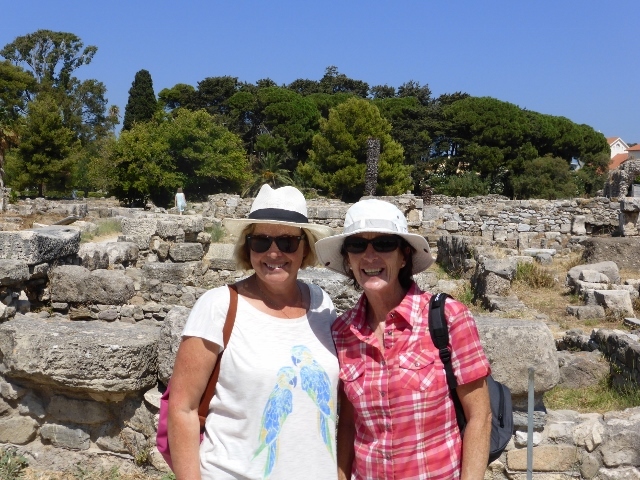 Sue and Swanno had given us information on driving around Kos and told us how to avoid the white roads (unpaved) on the map. They might not have gotten the same map. With any excuse for a run, Sue ran in front of their rental car to ensure the pot holes wouldn’t swallow it. Except for one unpaved road near Tigaki, we managed to stay on paved roads. Thanks Swannos. 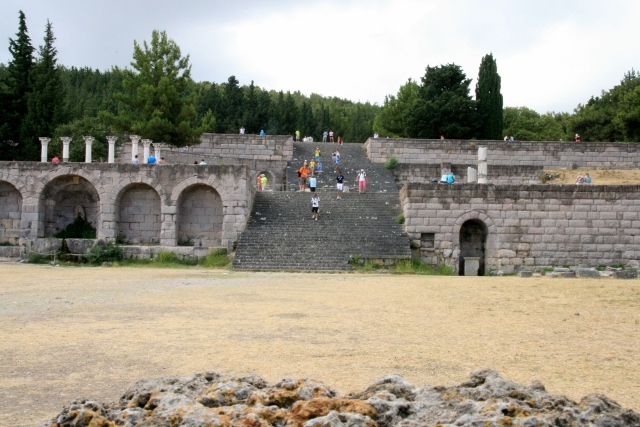 We started by visiting Asklipieion, More on that tomorrow, it can’t all fit into one blog. 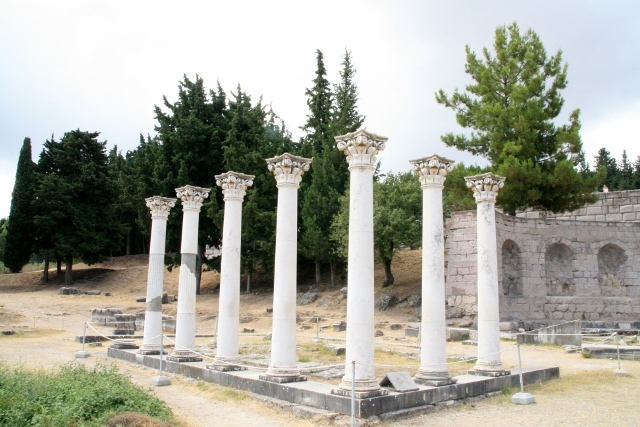 We went from Asklepion to Asfendiou, which are the five mountain village of Kos. 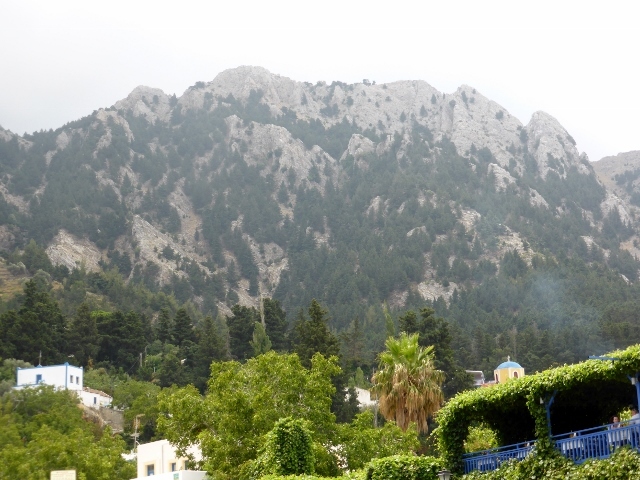 Unlike other islands, Kos has clouds in July caught on the summit of Mt Diakios. There are forests of cypresses and the area is very lush. We drove into Zia and we thought we were in Bali, streets full of stalls of ‘souvenirs’. We only got out of the car to take a photo of the summit overlooking the village. Tour buses of ferry passengers might be the big buyers but you can not see the village for the stalls. We drove by beautiful churches, many on the highest hills away from other homes. We drove through Pyli to Mastihari and went to the Kosta recommended TamTam for lunch. 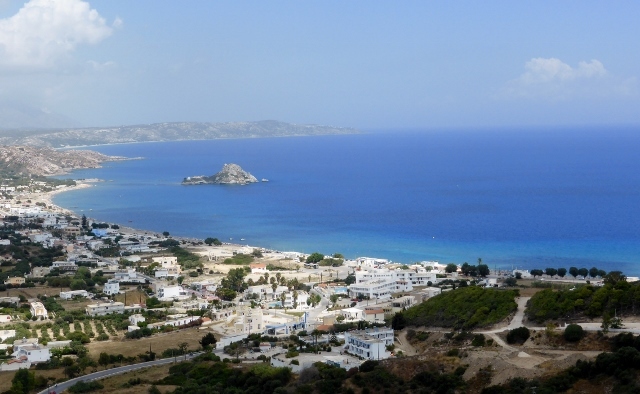 This coast Mamari and Tigaki have many resorts with kayaks, swimming, sailing and wind surfing all on offer. Kosta hired us the car and gave us a great map and circled all the highlights for us. TamTam was not too expensive, he told Jim. He never mentioned the fact that it was fantastic. You could easily spend the day here. A beach, beach showers, a restaurant and deck chairs for people who just want a drink or coffee between swims. Still we had more places to see, we drove to Antimachia and visited the windmills, kindly dressed with their sails. 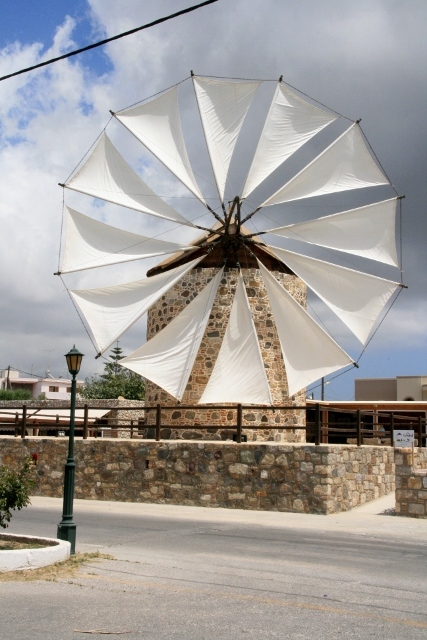 These windmills are on many of the islands, used for grinding grain and may be as old the 16 century. They would be able to supply the grains to passing ships. 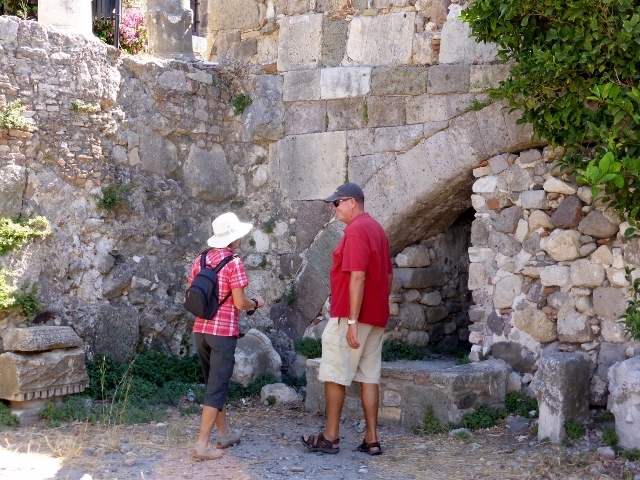 There is also a Venetian fortress nearby, so the windmills are probably a Venetian addition to Kos. 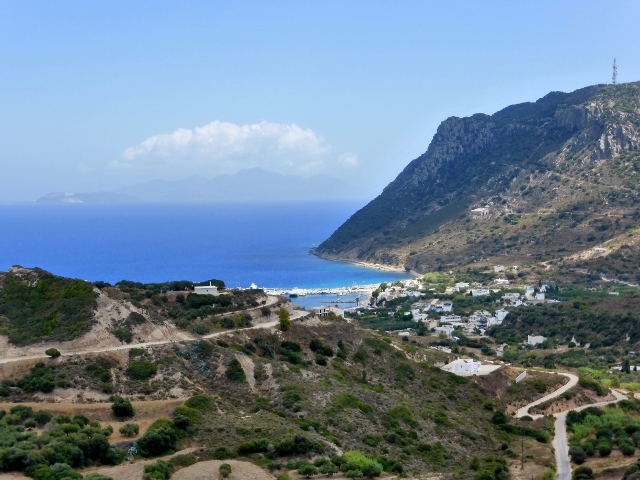 Some of the nicest beaches on the islands are in the vicinity of Kefalos, including the little volcanic plug of Kastri Island. Paradise Beach, Camel Beach, are in Kamari Bay, you can go and swim but it is really suited to families as the beaches go out quite a way before they become even waist deep. Plenty of water sports here too. We finished off with a visit to the Venetian Fortress, the goats had beat us there. There were plenty of walls and many Heralds on view. There are no buildings within the fortress except for two chapels. The Venetians used the fortress as a prison and it was often under attack by pirates. The weather has been great, sunshine and a breeze during the day and cool sleeping weather at night. 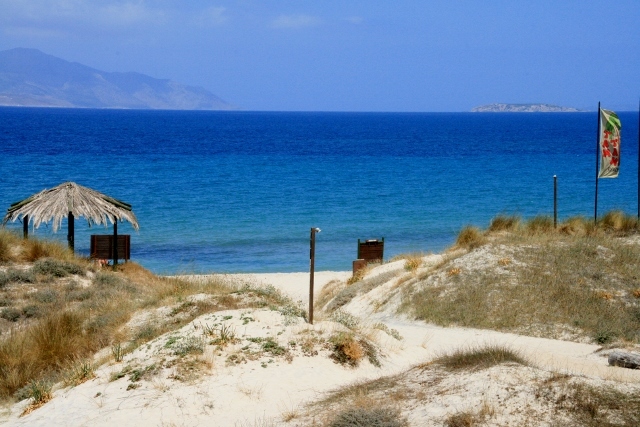 Yesterday, after walking from the Chora to town, we relaxed with a swim and later ate our dinner on the same beach. 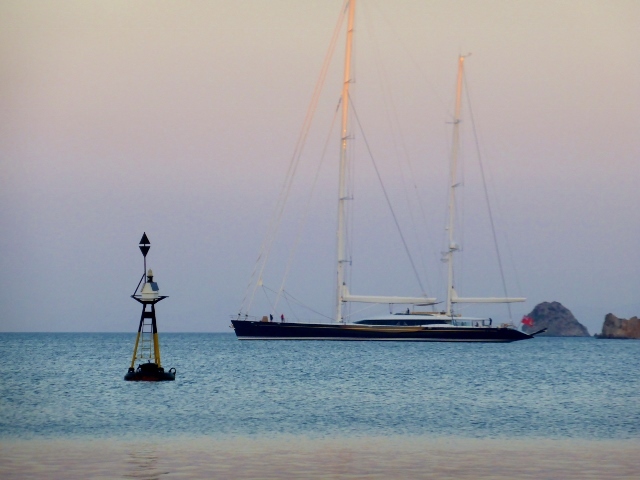 At twilight a beautiful blue yacht sailed in and anchored in Skala harbour for awhile. We much preferred this beauty and we think it may be the Murdochs’ boat. 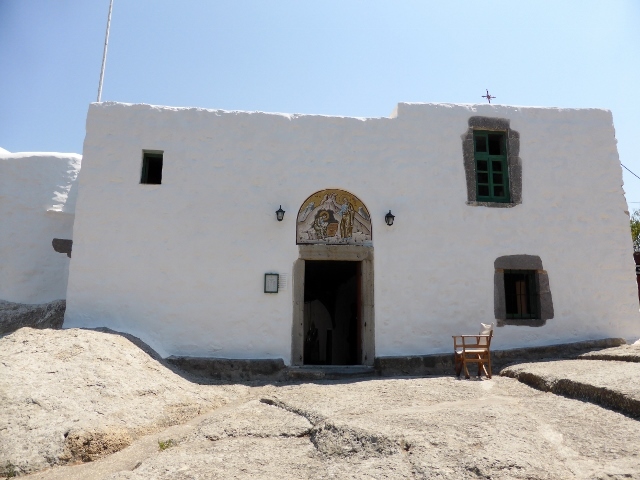 We were up early this morning to leave our wonderful Patmos and go and explore Leros. 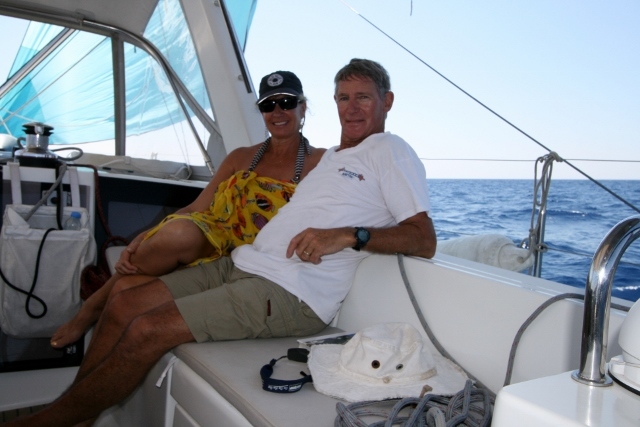 James, Sue and Swanno and I had the spinnaker up quickly. She is a beautiful duck egg blue and it was a perfect day to try her out. 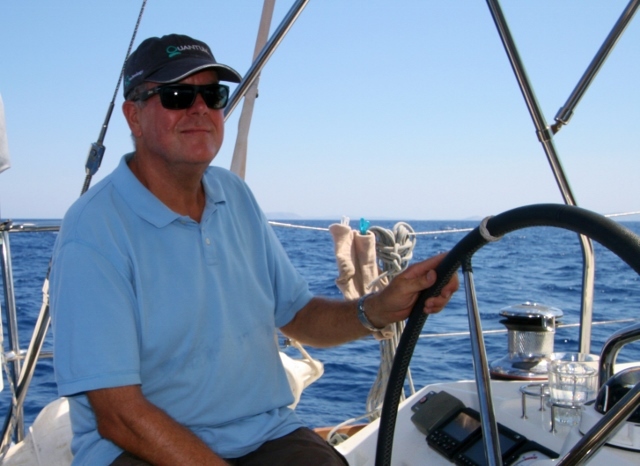 Sadly, when Davo was with us the meltemi was a bit fierce going to Mykonos for the spinnaker but we will rectify it next year. 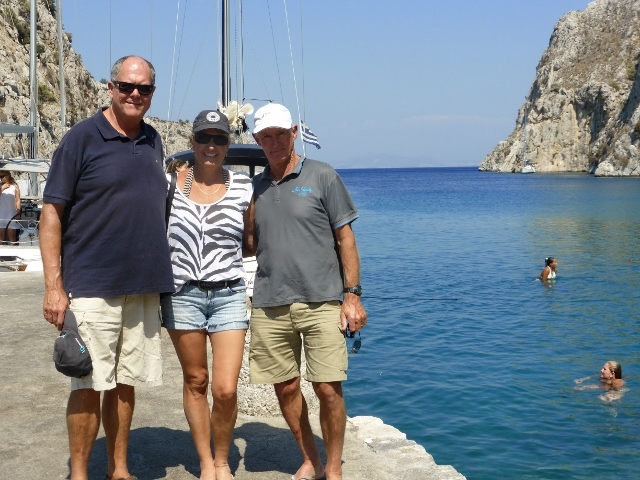 We stopped for a swim off the boat as we came into Lakki and the water was perfect. 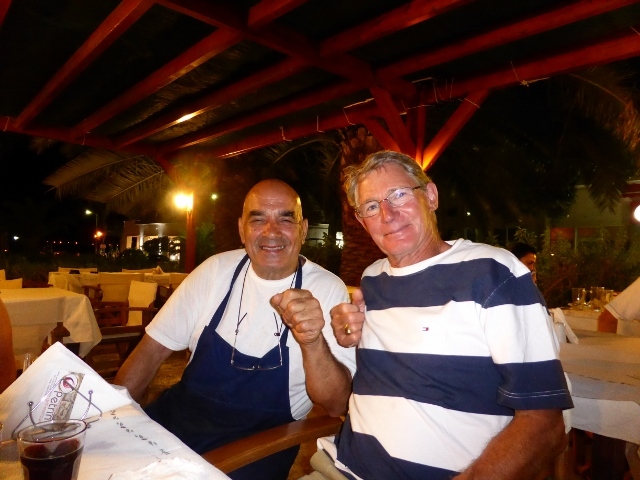 We are looking forward to enjoying all the treats Leros has to offer. We would like to offer our thoughts and prayers to the family and friends of the people killed in Malaysian Airlines flight disaster. 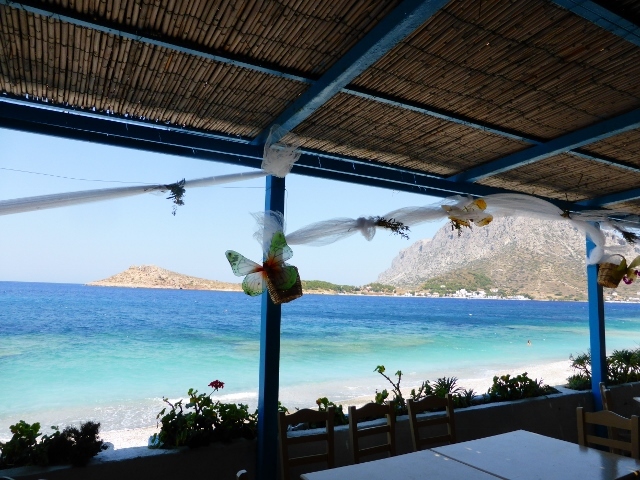 We have spent quite a bit of time this summer toasting with the Greek word Yamas or ‘to our good health’. Sue and Swanno flew in from safari in Africa. 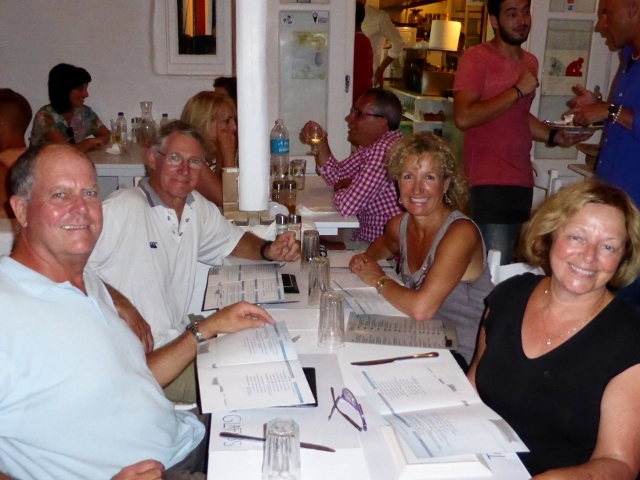 We collected them from the ferry in Parikia on Monday night and had a wonderful Greek dinner on the beach in Naoussa. 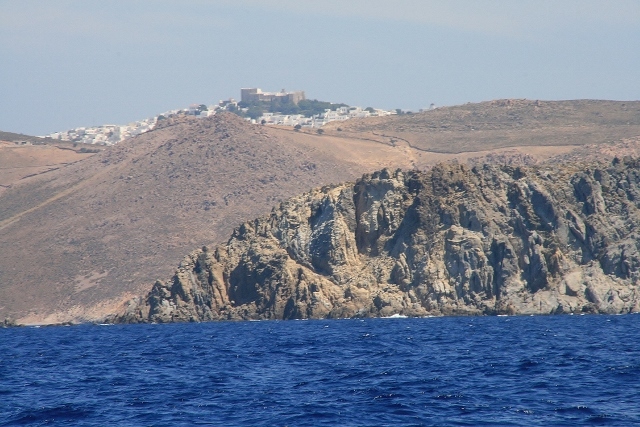 The next morning, we left our special port of Naoussa and headed for Donoussa, which was nine miles off the east coast of Naxos. We found Ormos Dhendro to be the perfect place to farewell the Cyclades, with a swim and a Sue-cooked dinner under the stars. Sadly also with quite a swell into the bay when we were trying to sleep. With the possibility of a strong meltemi, we departed before dawn to reach Patmos before the wind set in. Being up for early morning safari’s had Sue and Swanno in prime condition to deal with the rigours of sailing but they did keep asking where the staff were. 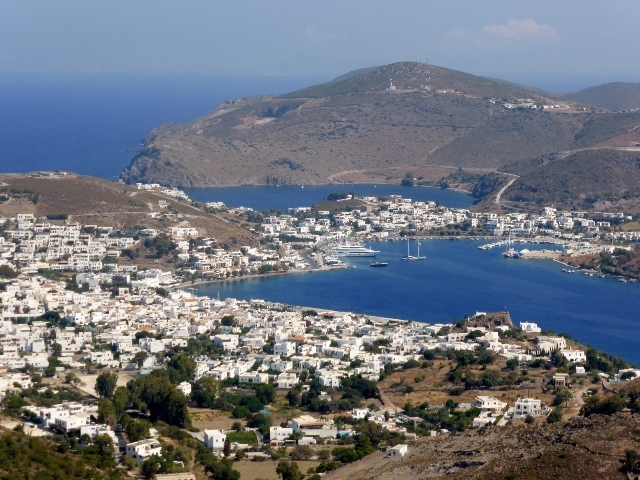 Patmos is the northern most island in the Dodecanese, so we are hopeful of having future meltemi’s on our stern. 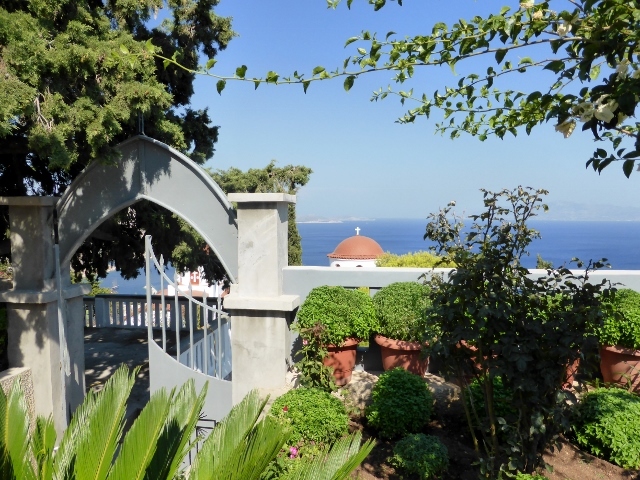 It is famous as the island where the Apostle, John the Evangelist, wrote Revelations. We arrived, swam and wandered about the town of Skala, shopping in the big AB market, which have lots of goodies, fruit, veggies and nice wines. This morning we went up to the Chora and visited the monastery and museum. 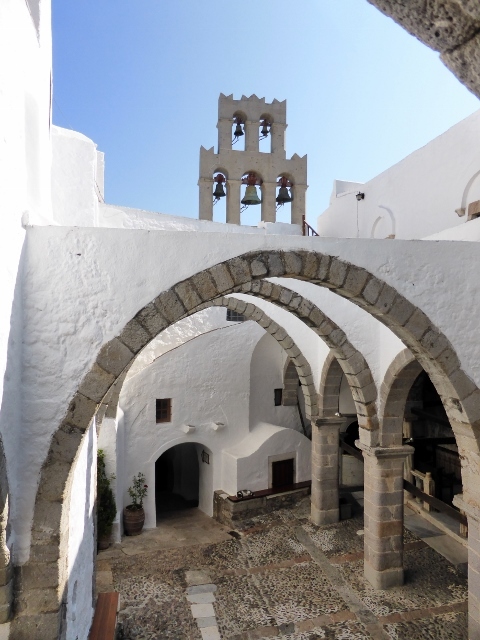 All Greek islands seem very different, Patmos chora prides itself on its spirituality. In Skala are lovely beaches and bays, shops, cafes and hotels but there is a strong underlying feeling of peace and serenity. 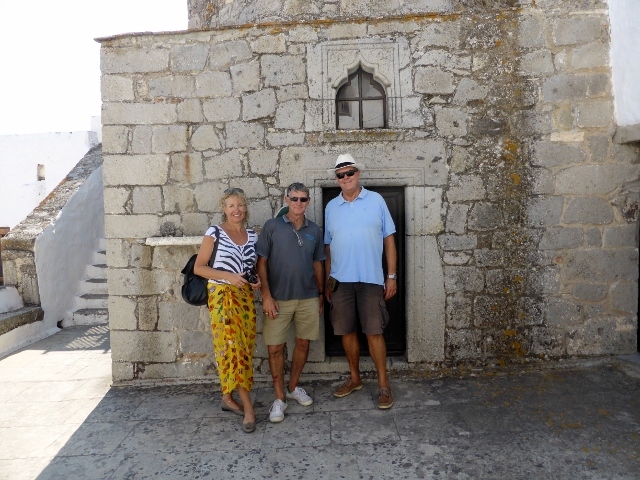 Sue, Swanno and James in front of the tiny door in the fortress. St John lived in a cave and the church of the Apocalypse, is now built around the cave. The cave is quite small and one can imagine a hermit living in this grotto and dictating his frightening visions for posterity. Sue and I were wearing sarongs over our shorts to visit the churches and monasteries. We weren’t allowed to take any photos, but we could understand it because of all of the precious icons, vellums and paintings. 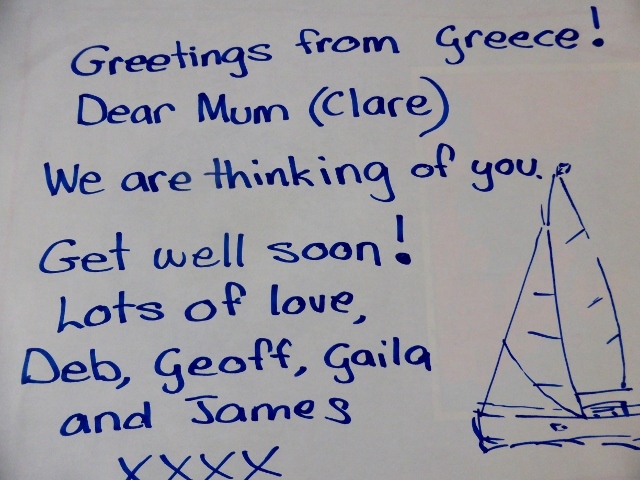 The four of us have been racing around Naxos and Santorini, kitty has been very busy. 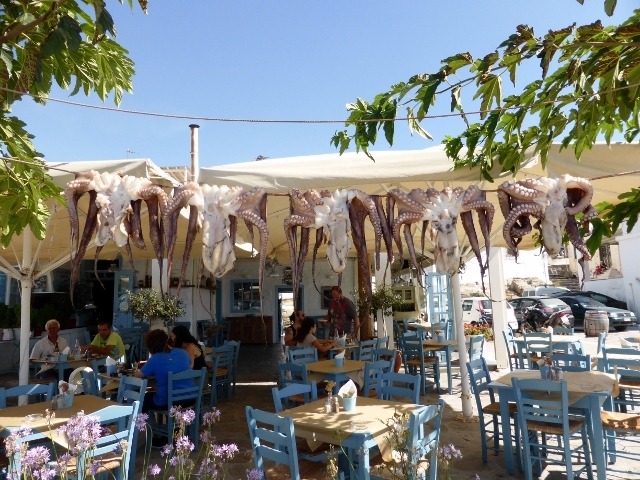 Now we are in Naoussa, Paros. 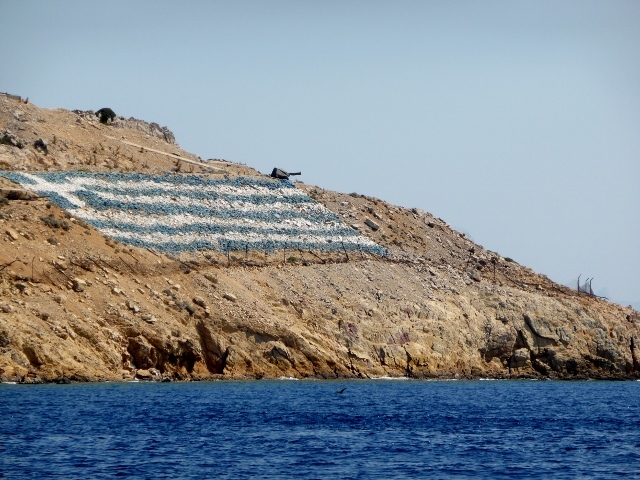 Paros is ‘the new Mykonos’. Deb and Gaila managed to do just a little shopping and we have found some restaurants and cafes and sat in the shade of umbrellas and trees. We have swum and floated in the cool Aegean sea and basically chilled out. How to relax your octopus. If there was a laugh to be had we took it, James and Davo were often in corners with a beer and we could hear the word ‘Squadron’ popping up in their conversation. 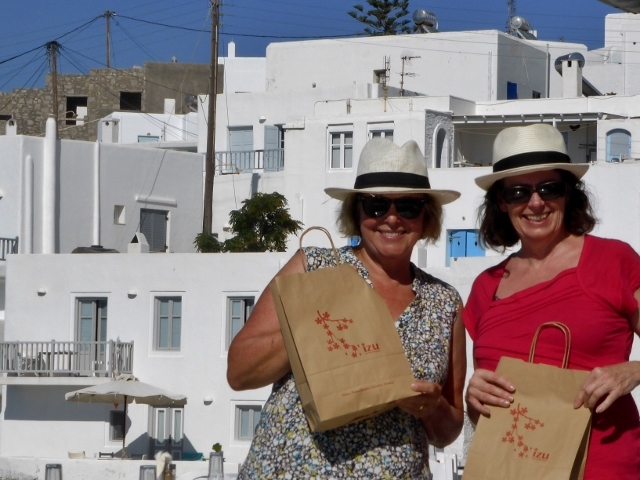 On Santorini we were too busy to shop, but on Paros when we would wander we would find some very interesting shops. We loved Izu for wonderful pareos and Melissa for jewelry and other interesting items. 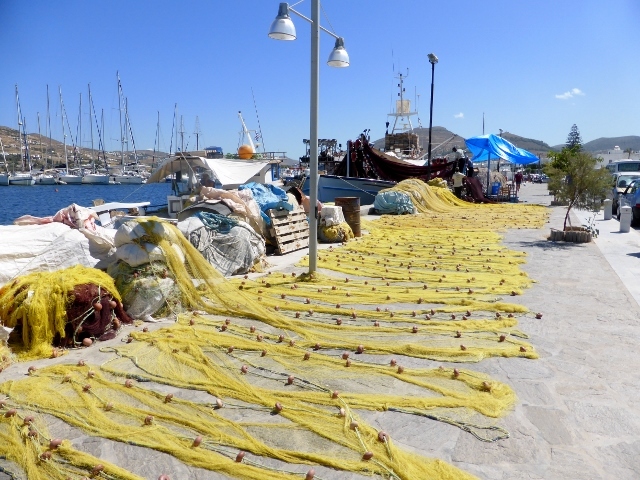 We wandered around Naoussa looking at all the fishing boats and nets and we visited other village, with their older style houses and wonderful churches. We are going to miss Geoff and Deb. We had such a good time. The entire crew of Mercier have been worried about you. We are so glad that you are getting better and will soon be back to your own healthy self. We were thrilled to hear your voice today and we wanted you to know we are thinking of you. Love to you, Tom, Melissa, Hugh, Julia,Jenny and Brian. Get well soon and thank everyone who is looking after you from all of us. 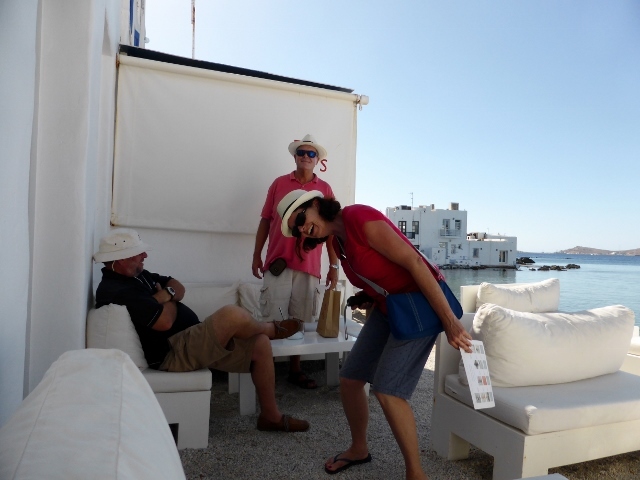 Naxos Port has a hands on harbour master, Nikos. 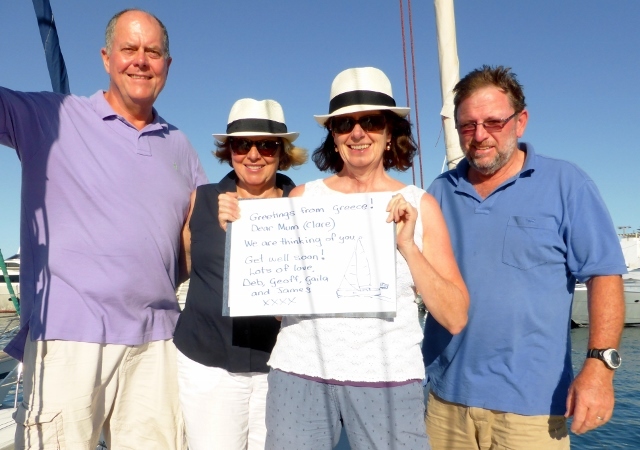 We knew we could leave Mercier at Naxos and take a ferry over to Santorini. 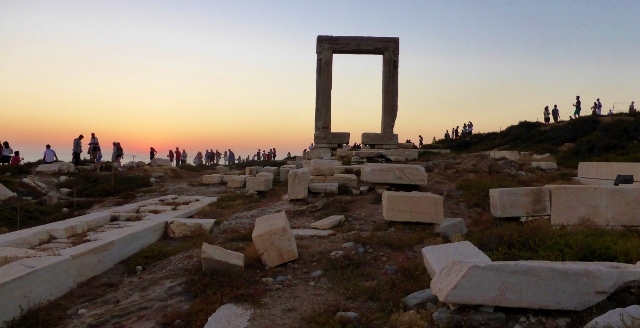 We departed Mykonos on Tuesday with a diminishing meltemi in three and a half hours sailing we were in front of the Portara Gateway from the unfinished Temple of Apollo and sailing into Naxos Town. We walked up to the Venetian Castle and then wandered through the winding alleys of the medieval quarter called the Bourg. It was before the end of siesta, so you could easily imagine that the pirates had come and taken everyone away. The only residents we saw were some very sleepy cats. Wednesday evening found us at the Potara Gateway on the islet of Palatia, looking at the sunset with the other tourists, but when the sun went down, they departed. Merro pulled out of his trusty Squadie bag, a bottle of Mercier Champage and we sat on the ruins and toasted absent friends. 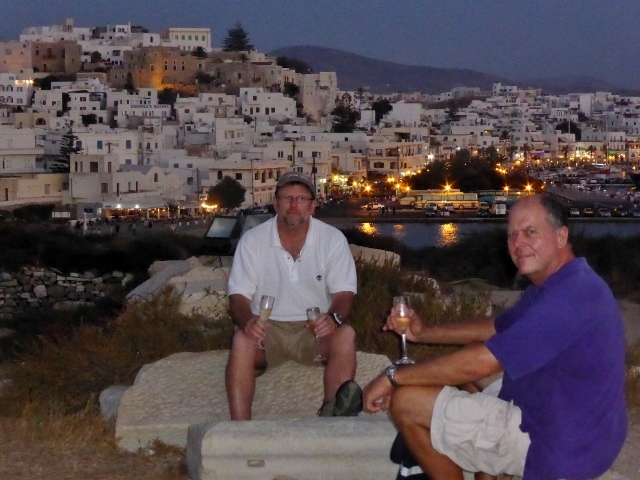 On Thursday we toured the island of Naxos in a little rent a car. 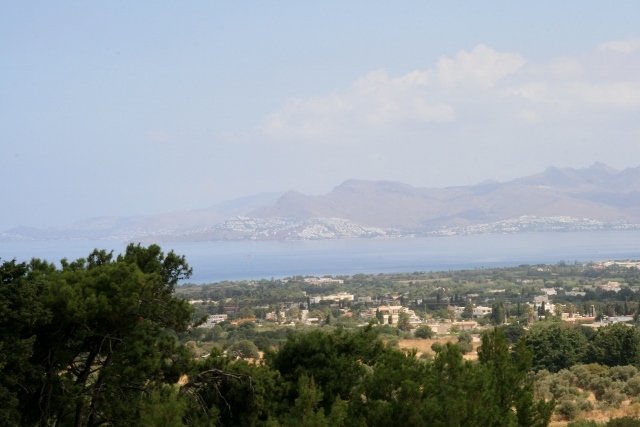 First north to the sleepy beach village of Apollon, through very windy roads in a verdant landscape of olive groves and fruit trees. 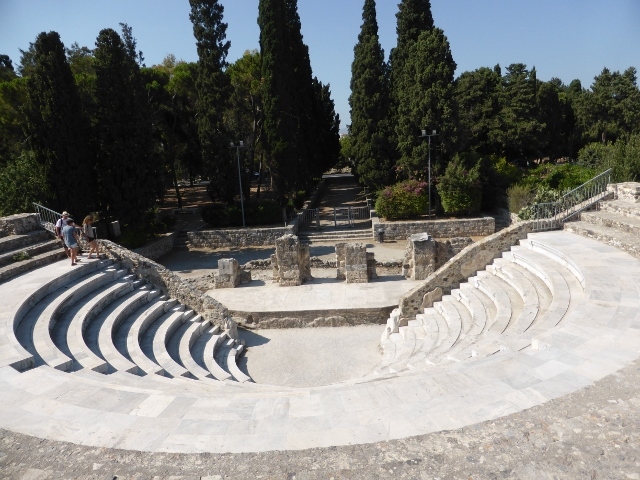 You wouldn’t think Davo was a sentimental bloke, but he gets almost misty eyed at the sight of the gum trees he is seeing on these Greek islands. 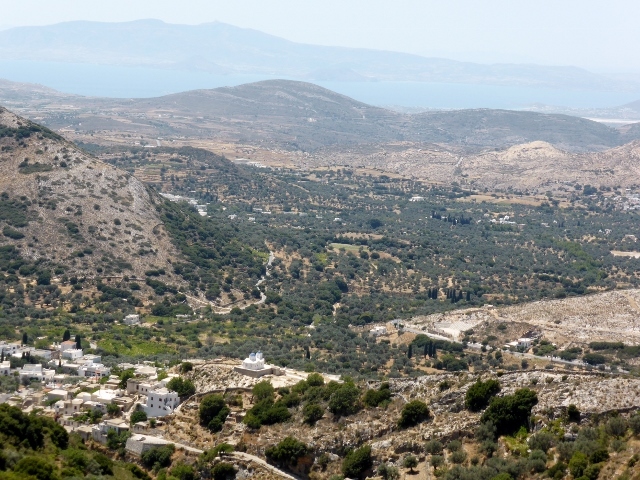 The dry barren islands of the Cyclades really are a perfect second home for these gum trees.We had a wonderful lunch under the shade trees in the hilltop village of Apeiranthos with cool breezes and wonderful food. We ended the day without cameras at the beautiful Plaka beach south of Naxos town and had outdoor showers and cocktails at a resort there. 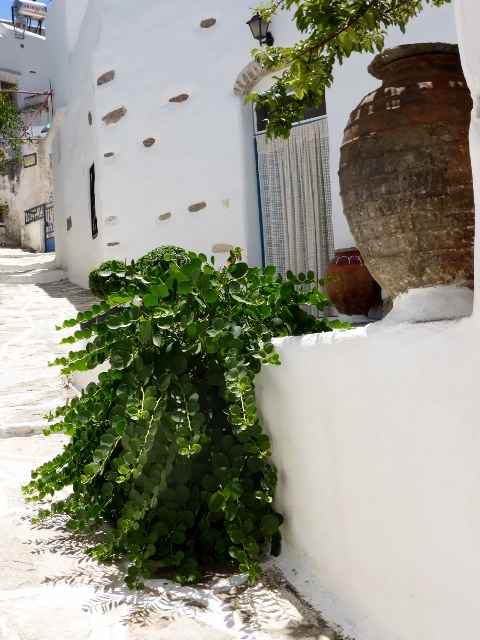 Naxos is a beautiful island, maybe we will all get to return.